Tom Colicchio loves food, but he’s not defined by it. While most of you may associate his name with his role as one of the primary judges on Bravo’s Top Chef, Colicchio’s culinary skills and devotion to the art of good food stretch way beyond a reality TV competition show. The James Beard-feted chef owns restaurants in New York City and Los Angeles. He’s the author of multiple cookbooks and he occasionally pops up on TV shows like HBO’s Treme, The SImpsons and even in culinary documentaries like 2013’s A Place at the Table. 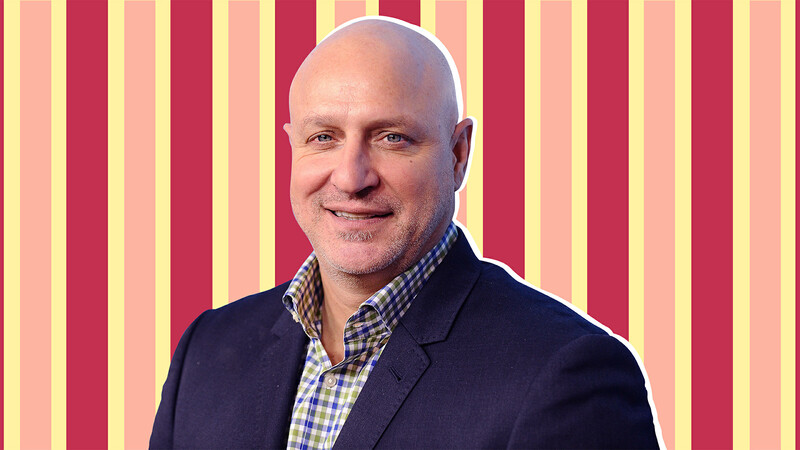 With Colicchio’s schedule looking somewhat less hectic these days with his Top Chef duties on hiatus, he found time to sit down with SheKnows and talk to us about his day-to-day routine and how he keeps his body and mind as healthy as possible. Whether it’s finding time to connect at the dinner table with his wife, Lori Silverbush, and their three sons or taking a moment to find his Zen spot in his garden as the sun comes up, Colicchio was able to let us into his world in this fun interview. SheKnows: What’s your go-to healthy breakfast? Tom Colicchio: Often, I’m eating on the run. Granola, some yogurt, some fruit, lots of coffee [laughs]. But you know, I mix it up. It could be a poached egg over some grains with avocado. There’s no one particular go-to. But it’s important: Breakfast really starts your day with nutrition. So yeah, it could start with a lot of things — it could even be a sandwich too! SK: What’s your favorite healthy snack? What about snacks you make for your sons? TC: With my kids, we try to keep the sweets away. They snack on carrots, cucumbers, red peppers, things like that. There’s an occasional granola bar and things like that, maybe some raisins for something sweet. But we try to have them eat healthy food. SK: What’s your best tip to working parents for having a healthy work-life balance? TC: Keep it simple. It’s not about how fancy you can make your food; it’s about how nutritional you can make your food. It’s about how delicious you can make it as well. I think too often people get wrapped up in watching some TV shows and watching this beautiful food that’s highly decorated and looks really fancy — save that for TV. Really, at home, it’s about getting good, nutritious food on the table quickly and really spending time at the table with your family as opposed to trying to run around making fancy food. SK: How do you balance alone time for yourself, time with Lori and quality time with Luka, Mateo and Dante? TC: I try to get home for dinner so we have that time at the table. I’ll typically go back to work after that. I just try to find that time to be together with the family. I think that’s important, and I think often that can happen around a dinner table. We also find that if you’re just home with your spouse and you’re talking about your day (or with the kids), ask them about their day. Often, you get blank stares, but I think just encouraging them to talk about things they care about so that they think they have some importance. I think that’s where we really get that give and take and that they feel some control over that getting-together process. SK: What would you say is your biggest day-to-day challenge as a dad? TC: [Laughs] I have two young ones — they’re 6 and 8 — so trying to keep them from killing each other is the big challenge. They like to go all out (they call it “battling”) and it’s all in good fun, but usually ends up with somebody getting hurt. It’s trying to refocus their energy, not on each other and things that they’re doing. But that’s kind of it, really: just keeping them safe and little things like trying to find time in a busy day to be together. SK: As your sons grow up, how do you see your career and your lifestyle changing? How will your goals as a parent change? TC: I’m a little further out of my career now, so I can make my own schedule on my own time. If there’s a school activity, I can get there. I have a 24-year-old as well, and it was early in my career and I couldn’t always get to those things [of his]. So the second time around, it was a little easier because I have a little more control over my schedule. But the challenges are making sure that [my kids] get their homework done, making sure they’re happy, making sure they feel safe, making sure that they feel heard, making sure that they feel good about themselves. Kids, just like adults, can really get ahead of themselves, and I think it’s really important to listen to what they’re saying and try to understand them. SK: Do you meditate, journal or have any other sort of emotional wellness routine? TC: You know, I started meditating recently! I use one of the apps and its kind of neat. I’ll find that a lot of things I do in my everyday life are meditative. I try to fish a lot. I garden. I’m out in the garden at 6:00 every morning while everyone is waking up and it’s kind of quiet time. I don’t feel rushed or anxious, where in my everyday life, I’m anxious because I have to go from meeting to meeting or rush to a restaurant. So when I’m in the garden, I just kind of zone out and really just find a good pace. I find that digging in the dirt is really helpful. Finding those things that connect you to the Earth, connect you to the environment, I think that’s really helpful. SK: What’s your favorite date-night (or day) activity? TC: Movies! My wife’s a filmmaker and we like to get out to a movie every now and then. It’s becoming much more difficult these days. Sundays are Game of Thrones days. It’s a great date night; it’s our favorite. We try to find time for date night and often we have good intentions, but then it’s like, “Are you tired? Let’s kinda hang out,” [laughs].